We don’t tend to print out many photos, however, every year we create a family photo album book. Well apart from the hundreds of photos we have going up the stairs of course!!!! What is especially nice is that Freddie now nearly 9 remembers everything we have ever done. At least once every 3 months he will look back through all of our family photo album book to remember. He even shares them with his friends, who often will appear in our family photo album book. They all love looking through and seeing what they have been up to in the past. They also enjoy seeing how much they have changed. 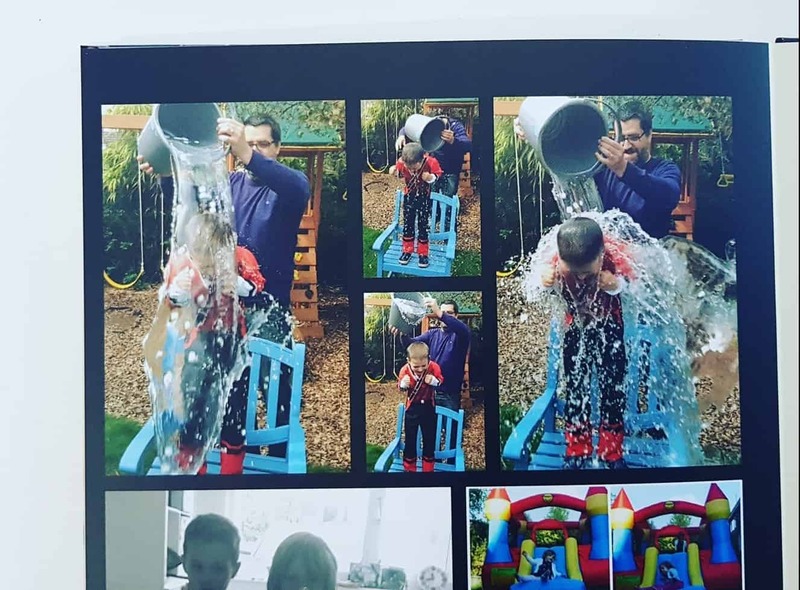 We have been creating these annual memory photo books since Freddie was born, so there is one for every year (Actually the first 2 years are included in one book, as I worked full time). But ever since we have made sure to take lots and lots of photos. The photos in the memory photo books have mainly just been taken on my phone, and lots are not even “instagrammable”!! BUT, they are perfect memories and they mean so much to us. These are the last 7 years photo books. We absolutely love them, and they live in the living room for all to see. The first ever family photo book we created was this one. This covered the first two years of Freddies life. I can’t believe he was ever that small, he is now in a size 4 shoe and soon will be taller than his grandma. I am 5 foot 9 and a half (yes that extra half an inch is important!!) so it will be a while before he is taller than me. This is a page from inside the book. I try and get as many photos as I can per page (as there are literally thousands!). Never mind Freddie, I can’t believe how different me and Stuart look! Especially without the beard!! This is a special book, as this is the year I gave up work to become a full time mum. It is the best decision I have ever made. We got to spend so much time together and had so much fun. In fact this is more about what it is like now. We have been home educating now for 5 months so we are always together. We both love it. Ah this is the year we got our Westie, Marlo. This is another special one, as this is when Freddie started school. He no longer goes, as he is now homeschooled, but this wasn’t until 2018. Look how little he was when he first started. As Freddie is a December baby, he was one of the oldest as well. We managed to fit a trip to Legoland Windsor in before he started school. We stayed in the Lego hotel and it was amazing. Although it was incredibly expensive. Haha, do you remember the ice bucket challenge? Well Freddie won’t forget! Although to be fair this was warm water!!! Well we do love a good North Pole Breakfast! We didn’t really do too much in 2015, we had a couple of holidays to Centre Parks, and went on holiday to France. But apart from that nothing too exciting happened. Although there are still about 60 pages of photos, so we had lots of days out. This photo book is one of my favourites as we went to New York, Naples Florida and Disney and Universal in 2016. This was the start of our long haul travel with Freddie. We had actively avoided long haul travel until now, as we thought he was a bit too young. This is the most recent photo book we have as it is 2017. Another great thing about these family photo books is you can add 2 photos on the front and back cover. I always opt for a hard cover A4 portrait book, but there are lots of different options. This is one of our favourite holidays, we spent our 40th and 50th birthdays in Jamaica. Christmas at home. God I love Christmas! These books mean so much to us and we look at them all the time. Why not treat your family to one for Christmas? You could make one for each holiday you have, or just of a special occasion. There is currently 50% off photo books at Photo Box so a perfect time to treat that special someone. Do you create a family photo album book every year? Making memories is important but remembering them is just as important. See why I create a family photo album every year.